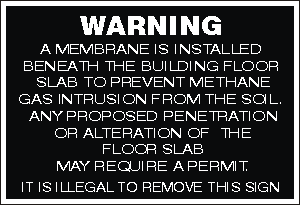 "WARNING A MEMBRANE IS INSTALLED BENEATH THE BUILDING FLOOR SLAB TO PREVENT METHANE GAS INTRUSION FROM THE SOIL. ANY PROPOSED PENETRATION OR ALTERATION OF THE FLOOR SLAB MAY REQUIRE A PERMIT. IT IS ILLEGAL TO REMOVE THIS SIGN." can easily be attached with double stick tape, nails or screws. The word WARNING is in white letters 3/4" high, with 3/8" tall lettering on the rest of the sign. Red background with white letters, or black background with white letters. Will resist scratching, will not fade or chalk. If your specific county or state requires additional information posted on the signs we can custom print signs with screen printing (large quantities) or digital printing (quantities of 12 or less). Please contact us via email sales@anytimesign.com for a quote. Information needed for a quote and layout : 1. Size of sign. 2. Quantity of signs needed. 3. Sign color, or colors. 4. Sign wording.